The dinosaur park is a dream of mine that started out with me wanting a life size dinosaur. I couldn't afford one so through much trial and error I built myself one in 2007. 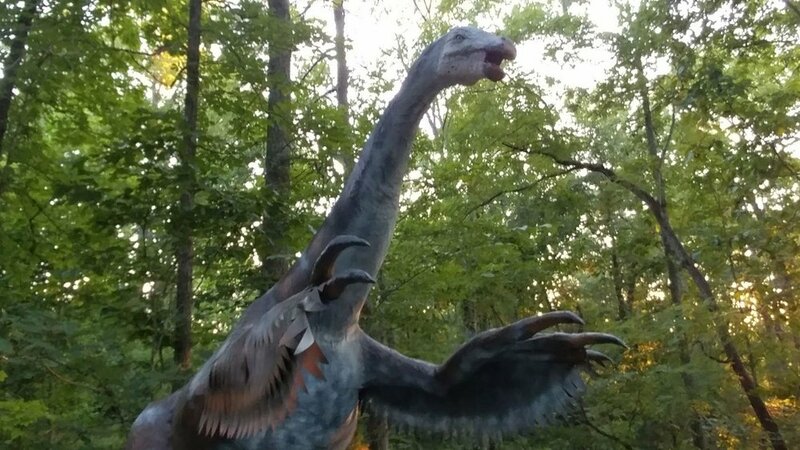 We received a lot of cars stopping to take pictures of our first one, the Jurassic Park-like Raptor that now stands just outside the entrance. After that one we built another and another, finally deciding to make a park of it for all to enjoy. We currently have over 40 prehistoric creatures with more coming soon as we grow. We have a picnic area and the local Pizza Plus delivers here. We also have a small gift shop. We're a donation based attraction, which means we don't currently don't charge any admission to get in. We want children of all ages to able to afford to come here and experience life-sized creatures from our wonderful prehistoric past. All donations and gift shop purchases will aid us in expanding and becoming a better attraction for our patrons. We're open everyday from 9AM to 9PM, tours are self guided, photos and videos are permitted. We ask that no one touch the dinosaurs or exhibits except where intended. There are maps available for free at the entrance with information on the animals in the park and informational signs on each animal. Backyard Terrors itself is our artistic endeveour that puts together any creative aspect for your needs, mostly dealing in parties, the haunt industry and events we also create custom projects for individuals, if you must have a dinosaur or alien in your yard we can help! In addition to the permanent Dinosaur Park we currently own and operate The Funhouse Haunted Attraction, a seasonal haunted house here at the Park location. We do participate in many events as well throught the year, keep an eye on our facebook page for details. Thank you so much for allowing us to do what we are good at and being able to serve the public while doing it. Our mission as always is to Entertain, Educate, and Impress!